The Angler Young Angler Tournament or the AYA is designed specifically for children and youth to learn and enjoy the activity of fishing. First organized by Lund Boats in 1998, AYA fishing is meant to engage youth and give them a chance to fish in a competitive tournament atmosphere while still focusing on education and entertainment. The AYA consists of nineteen regional tournaments and until recently had a final tournament in Kenora for all the winners of the regionals. Red Lake’s tournament began thirteen years ago, through the efforts of Dale Hayward and for the last nine years Mark Vermette. There are a total of forty boats in the competition with one adult angler and two young anglers who can be 17 years old and younger. They leave early in the morning and are allowed to go anywhere in the chain of five lakes that make up Red Lake, with each participant’s favourite spot kept a carefully guarded secret. ​The anglers catch walleye, with a limit to four fish which can be one over eighteen inches and three under eighteen inches. Winners of the tournament are based on the combined weight of the four catches and they receive a Lund Boat package that contains a 12 foot boat with a Mercury FourStroke outboard motor and a trailer. Until last year, they also received five hundred dollars to help with the expensive of getting to Kenora for the championship. The winner of the Kenora championship would receive a trip for four to Disneyworld. Other sponsors also reward prizes, with the idea that after the top three winners the adult anglers do not get a prize but every young angler who takes part walks away with something. The AYA used to take place on the last weekend of May but is now held the first Sunday after the August long weekend. This change was to help maintain the number of people that participate. As the children who competed in the first few years grew up, the tournament organizers needed to entice younger families to get involved. The August weekend has better weather and creates better fishing experience for the families that partake. The AYA aims and achieves in creating an ultimate experience that goes beyond fishing and creates memories that will last for a lifetime. "The AYA aims and achieves in creating an ultimate experience that goes beyond fishing and creates memories that will last for a lifetime"
The now unmissable Red Lake Fall Classic started out as the Keystone Klassic Walleye Trail Fishing Tournament in September of 1993. It was part of a series of weekend tournaments held across Ontario and Manitoba run by the Manitoba-based Keystone Walleye Trail Group. Slightly more than half of the 200 people who paid the two hundred dollar fee for the two days of fishing were from outside of Red Lake, with the majority from Manitoba. On the Saturday morning over 100 boats left at 5 second intervals, to return around 4PM for the weighing of the fish. By the end of the tournament on Sunday, $5000 was given to the overall weight winners Phil Poulton of Red Lake and Ian Hendrikson of Calgary. Cash prizes were given to the top 10 places and valuable merchandise was given to places 11th through 15th. While the local economy benefitted greatly from the tournament, there was deep concern among the locals for the number of fish that were killed during the tournament. This concern was still present at the 1994 Keystone Klassic, where many discussions were held about the possibility of the Ministry of Natural Resources doing a fish mortality study during the tournament to determine why so many fish were dying during a catch and release tournament. To reflect new publications of studies about fish mortality, the tournament changed it rules and regulations yearly to prevent the unnecessary death of the fish. When fish did die during the handling, an attempt was always made to fillet and distribute them to people who were unable to catch their own, particularly the residents of the seniors’ apartments. 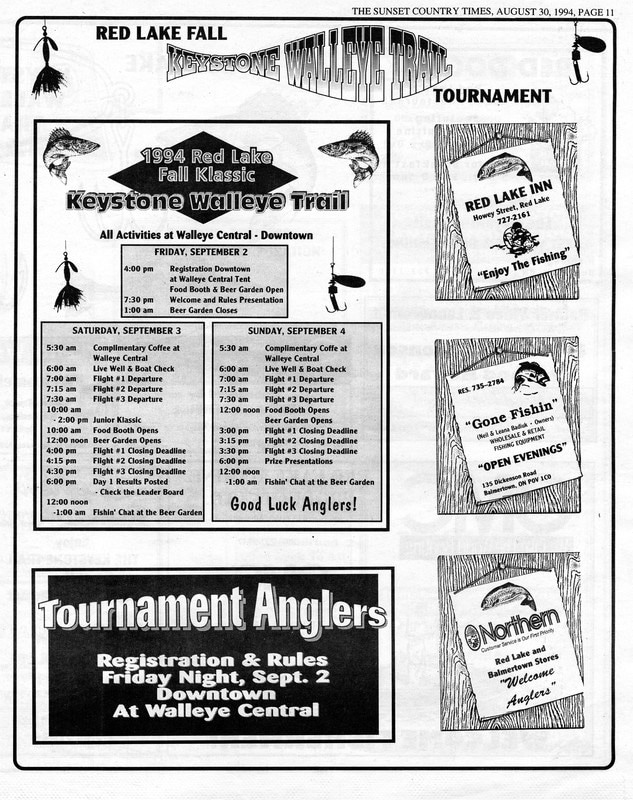 1995 was the first year that the Fall Classic was held independently of the Keystone sponsor. Participants were increased from 100 teams to 125 teams but only 82 entered and 80 finished successfully. The Fall Classic Committee adopted a ruling system that was particular to the area to help preserve and prolong the fishing in the area. It introduced a four tag system, which meant that every team had to make the decision to catch or release the walleye at the time of the catch. All walleye had to be tagged before being placed in the live well and any team found with untagged fish would be disqualified. Teams were only allowed to retained two walleye over 19 inches per day. Lakeside Marine and Red Lake Marine joined together to donate a 16 foot OMC/Alumarine boat and motor combo for the early bird entry draw, which went to Mike Maxfield and Dave New. While the tournament has been running for more than twenty years, the basic structure has remained the same. Everyone entered in the tournament must attend the Rules Night on the Friday evening. On Saturday morning, the boats leave from the government docks in three groups with 15 minute waits in between each group. There is a cut off of 140 boats, simply because it takes too long too long to weigh the fish which is not healthy for them before release. The order of teams is decided by the where they placed in the tournament the year before and if they registered by the proper date. After the registration date has passed it becomes first come first served. Boats can go anywhere on the five lake system of Red Lake but are not allowed to go to shore during the tournament except to weigh their catch. The teams are allowed to catch two fish over and two fish under 18 pounds, because that if the healthiest fish size. Volunteers on the docks will do the weigh ins and slot sizes, often after they return from their own fishing. Prizes go to the team that has the heaviest combined weight over the two days of fishing.